Yeah! I went and watched Aisha! And no it is not as bad as everyone is saying it to be. Yes, there is no scope of any acting per se, because all of them are playing the part of what they really are, super rich and super spoilt to the core. So, well, they are just being natural. But it was a refreshing change to watch nice, wearable glamorous wardrobe and lovely make up. It was fun to see Aisha drive her beetle *THAT IS LIKE THE CAR*, most of all the movie in itself was very easy going. The subject was not intense, it was just another love story with loads of love connections going wrongs and feelings being read all wrong. It is inspired from 'Emma', the English Movie was much better, but yeah you can see the shades of inspiration in the whole movie. It is the way the movie has been done. Aisha is a story of each of us in some ay or the other, I mean of course we do not have the money that she had, but we all have tried and failed miserably in match making and reading all the signals wrong. It is about having the fights with your friends because of your attitude problem and then making up again, or just about anything random that we have all experienced in our lives atleast once. Sonam Kapoor as Self indulgent Aisha is good. She is fashionable but her acting is becoming sorta monotonous. Cyrus Sahukar as Randhir Gambhir is great. He as a matter of fact has out performed the protagonists in the movie. I really loved the way he did his part. Ira Dubey as Pinky Bose has the MOST hilarious one liners. 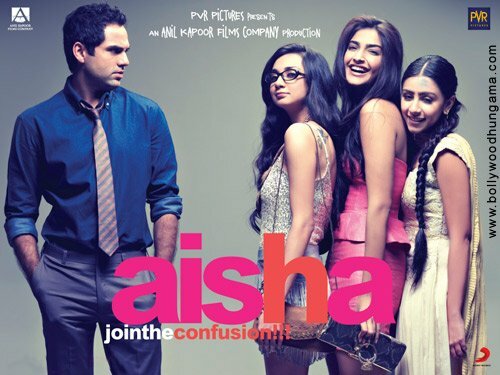 She is perfect for the role of Aisha's best friend, who is single ready to mingle, opinionated.. and lost in the world. Amrita Puri as Shefali from Bahadurgarh, is acting real time with panache. She has brought out the character of this small town girl who is ready for the marriage market and wants a hi-fi dulha so well, that it is surprising. Her comment on Jodhpurs *the pants you wear to play polo* "Yeh kaisi se pant pehni hai,iski toh fitting hi itni khraab hai"
Lisa Haydon as Aarti the New York return friend of Arjun. She looks like Angeline Jolie. Has an accent like her.. yeah so if you look at her you mistake her for Ms. Jolie. I know I did. The music of the movie is nice and peppy and has that new age feeling to it. My favourite song in the movie is 'Mithi Mthi Bol', there is a Bachata *Its a latin american dance form* number in it, and it has been choreographed by none other than my dance class people and they are in the video too.. so, I sat and pointed out as many as I could. The movie has so many brands advertising themselves, that you would feel at times that you are watching well shot ads, but please keep your eyes open, coz some of the things are really great. Especially her wardrobe! So go and have fun.. It is so nice to know that you had enjoyed this movie. With your review I am tempted to see it.